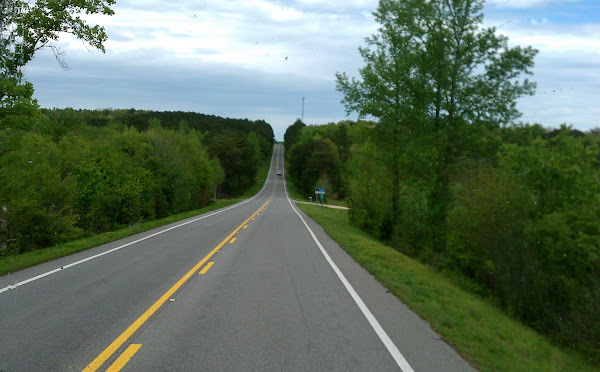 Home→Our Journey→On the Road→Outrunning a Storm – Demopolis to Double Springs! 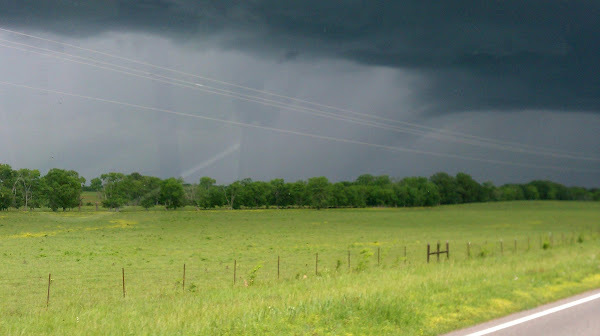 Outrunning a Storm – Demopolis to Double Springs! 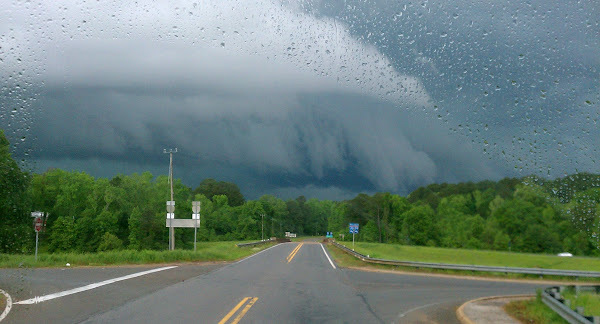 On Thursday morning, April 5th, the day of our departure from Foscue Creek COE Park, we awoke to hear that there was a severe thunderstorm watch and warning in northwest Alabama for most of the day – and potentially a tornado watch as well. Oh boy, just what we wanted to hear! As we prepped to leave, we closely watched the radar in Weatherbug on our smartphones. Such a colorful mass of green, orange and red heading right towards us! Luckily there were no tornado warnings in effect (yet) for our area. We debated whether we should stay and wait it out or leave and find a parking lot later to let it pass over us. What was making us nervous was that we would be traveling on route 43/13 for about 30 miles. Route 43/13 is a two lane road with no shoulder (that means NO shoulder, no pavement, no grass, just a ditch) and basically passes through rolling hills, woodland and an occasional farm – no towns to speak of which meant that if the weather got bad, there would be no place to stop to wait it out. Since it seemed that the front wasn’t moving that fast towards us, we decided to go for it, so around 9:15 a.m. we hit the road. Shortly after we left it started raining, but just lightly so not a problem. While Rob was driving, I was closely monitoring the radar and we were both watching the very ominous clouds and flashes of lightning up ahead. Our guess was that we might be able to make Interstate 20 just south of Tuscaloosa before the orange mass intersected with our path. 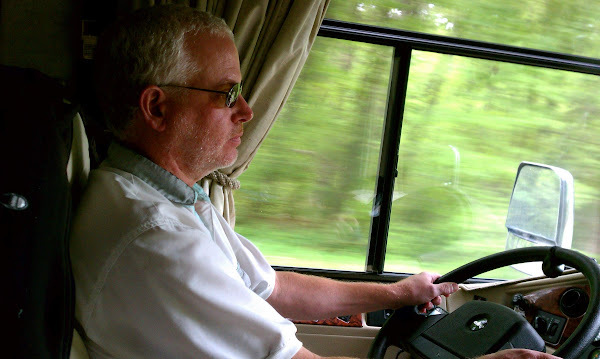 At Eutaw, we picked up Route 14 heading west toward interstate 20/59 (despite complaints from both Mrs. Garmin and Mrs. Google GPS systems — captain Rob was ready to toss both out the window due to their incessant nagging). After driving a few miles on this route, but thru a series of several zig-zaggy and tight intersection turns in Eutaw (along with every other 18 wheeler on the road), we finally got on 20/59 heading north. So far, so good – it appeared that we were staying just one step ahead of the weather, but it was right on our tail. After searching in Google Maps, we found a Lowe’s at exit 71 in Tuscaloosa which was the exit we needed to take to Double Springs so our thought was to stop there to wait out the storm. I-20/59 was OK but the pavement was rough and in a few spots almost rutted, so it made driving a little less than pleasant. Whew, we finally arrived at Lowe’s but the parking lot was very full with lots of cars and trucks – could all these people be shopping or were they sitting out the storm just like us? Since there was no room for us, we exited the parking lot and headed across the street to a very large, very empty K-Mart parking lot. We had just parked and had hunkered down when it hit! The high winds were causing it to rain sideways! As luck would have it we had parked beam to (broadside) to the wind. It was raining so hard we couldn’t see anything out the windows beyond the parking lot. Darn, we didn’t think to take any pictures or videos. The RV was rocking and with such strong winds, the rain started blowing in the window frame drains and bubbling up, so I quickly grabbed some towels and stuffed them around the frames. At this point in time, Rob decided that it would be better for us to head upwind so he started up the engine and changed our direction in the parking lot. That helped – the RV stopped rocking and the rain stopped seeping. We did make good use of the time and had lunch so all was not lost. All I can say is thank goodness we made it there in time! It would have been very difficult if we were on route 43 when it hit! I think overall we were there about an hour and fifteen minutes which wasn’t bad. Note: we later found that due to the sideways rain hitting us port (driver) side the recently installed high temp sensor module for our Norcold fridge (this was a recall) got wet and quit working – which means the fridge quit working. The water was blowing so hard it actually penetrated the refrigerator vent and blew up into the module. For now I have temporarily bypassed the module – this is not recommended by Norcold, but otherwise we have no fridge! I’m sure this is going to be a hassle to get repaired. Once the worst of the storm was over, the sun came out so off we went, continuing on our journey back on route 43/13 to the Corinth Recreation Area in Double Springs which is in the northwest corner of AL. At the town of Natural Bridge, we turned on to 278/74 which was a hilly, twisty turny, small shoulder two lane road, but it did have a truck lane on most of the uphills. Generally, up to this point I would have to say the roads were all pretty decent (except for the rutted areas on I-20). We finally turned onto 57 for about 3 miles which was a true zero shoulder country lane which brought us to the Corinth campground. Our primary reason for landing in this area was to visit the Tiffin RV plant in Red Bay, AL where they make Phaeton, Zephyr and Allegro series of RV’s. While Corinth is an hour and a half from Red Bay, that ride was in the wrong direction for our primary journey, so we figured we would take the toad (Odyssey van) to visit Tiffin and just continue on to Nashville with only a minimal detour in the Discovery. More on the Tiffin visit in a separate post. In Florida and in the southeast section of AL, we had quickly become used to the flat, straight roads. Not that way in this corner of Alabama! 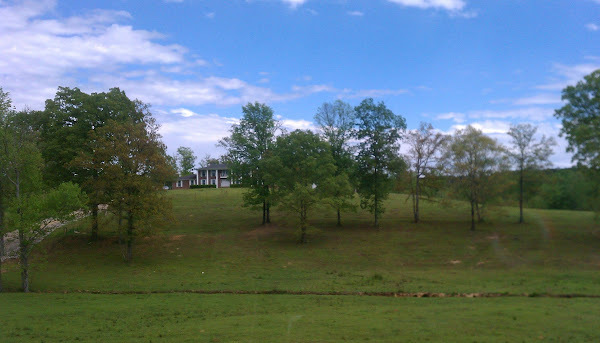 Rolling hills, lots of green pastures, and farms – very pretty countryside, reminding us of Vermont or New Hampshire. More on the Corinth COE Park and Double Springs in our next post. Wow….don’t ever remember seeing a sky that ominous! So glad you found a parking lot to wait out the storm, but sorry to hear about your fridge. We enjoyed shrimp from Billy’s last night. Next time we’ll try Aquila’s. Figure after six weeks we’re going to LOOK like shrimp. Oh, soooo good!